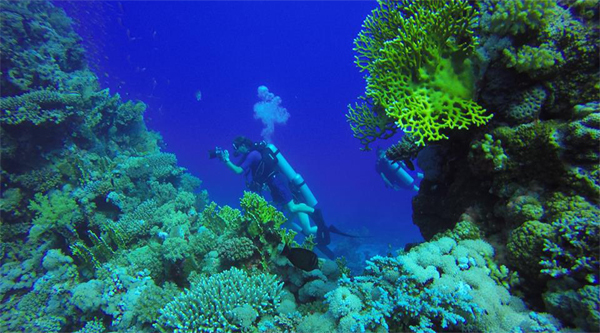 Sharm el Sheikh beaches are ideal for shore diving due to its easy access, closeness to many famous reefs and coral structures as well as low currents and ideal visibility. Explore Ras Nasrani, Tower and Pinky's wall while holidaying in Egypt. Ras Nasrani marks the beginning of the Gulf of Aqaba and the Straits of Tiran. Located north of Sharm EI Sheikh, the site has a beautiful white sand beach. This area is often the site of strong currents which bring oceanic fish, especially in summer. That makes Ras Nasrani one of the best places in Sinai to observe pelagic creatures, providing the potential for high-energy excitement. Whale sharks have been seen here. Tuna and jacks, rays and turtles are common visitors, with mantas and sharks more likely in winter. A sloping gray wall drops into sand at 150 feet. Interspersed coral heads are covered with soft corals, lending large splashes of colour to an otherwise monochromatic seascape. Some outcrops have as much as 25 feet of vertical relief, and are surrounded by goldfish and sweepers. A spectacular array of sea fans is stacked along the wall north of the entry, from 50 to over 120 feet deep. 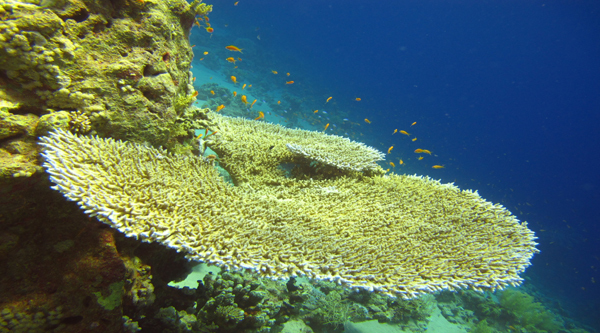 Individual fans, as large as 20 feet across, have soft corals growing on them. They provide an excellent foreground for wide angle photography. The deeper caves sometimes house sleeping sharks. To the right of the entry is a shallow slope with reefs cut by sand channels. There are fewer soft corals and less colour, but this is an excellent spot for close-up photography and for observing reef fish. The shallow reefs, at 15 feet and less are honeycombed with small caves that house sweepers, soldierfish, and an occasional grouper. A couple of medium sized Napoleon Wrasses inhabit the area. In the sand at 60 feet lives a large colony of garden eels which can be approached closely if the diver is patient. Ras Nasrani is also an excellent area for night dives, with flashlight fish, crabs and Spanish Dancers. The Tower gets its name from a rock formation above the beach entry point. Entry can be made through a cut in the reef, which opens to the rugged topography of a vast coral canyon. The sheer wall drops straight down to 300 feet, interspersed with small coral formations that are decorated with soft corals and surrounded by goldfish. All the interesting life is concentrated around the coral heads at depths of 100 feet and less. Following the wall to the left (north), there are small caves and overhangs. Usually lacking big fish, this is a place for close-up photography and wide angle silhouettes. However, manta rays and sharks have occasionally been observed here. Because of the short walk over the fringing reef, this is also an excellent site for night diving. Flashlight fish are common in the caves; octopus and cuttlefish may also be observed. Look into small crevices in coral heads for hundreds of sleeping Anthias. Pinky’s wall is a classic wall dive. Entry is a hike down a rocky ravine, then a short walk over the reef table. The sheer drop continues a long way down, but the best scenery is around the 50 to 70 foot level, and gets better as you proceed further south. Crevices and overhangs are decorated with spectacular soft corals, some of them growing over old strands of fishing line. This is one of the best spots in Sinai for profuse, uninterrupted soft corals. Perhaps because of the recessed location of the wall, there are few big fish, but lots of Anthias and sweepers hover around the outcrops. Sometimes divers will enter at Pinky's, swim south along the wall, and exit at Amphoras. The remains of an ancient shipwreck give Amphoras its name. About a half dozen small amphoras, overgrown with some eight hundred years of corals, are scattered around the reef at the 75 to 80 foot levels. The remains of three or four larger ones are there as well, along with an old anchor. Unfortunately, the largest amphoras were taken from the site a couple of years ago. Some of the jars contained mercury. Look for blackened areas on the corals, then fan the sand below to find the silvery liquid. There are many large coral formations, similar to Paradise. Fiasco reef got its name from a dive when everything that could go wrong did, and the guides never forgot it. 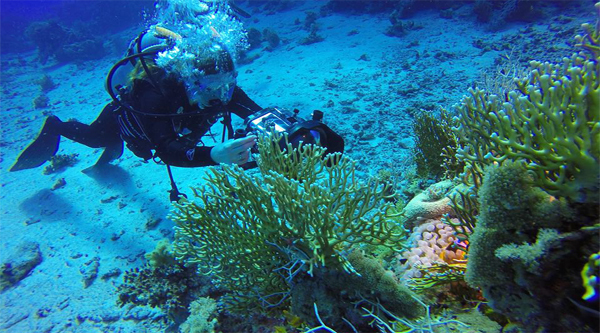 Like many dive sites in the area, the barren wall slopes gradually, with large coral heads scattered from 50 to 65 feet. There are nice table corals with sea fans and small schools of sweepers. The coral formations display wonderfully strange shapes, similar to those at Paradise. 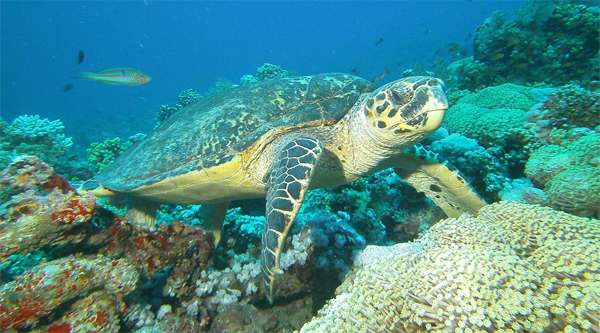 They are full of reef fish, nudibranchs, moray eels with cleaner shrimp, and blue spotted stingrays. Watch the outside waters for an occasional turtle. 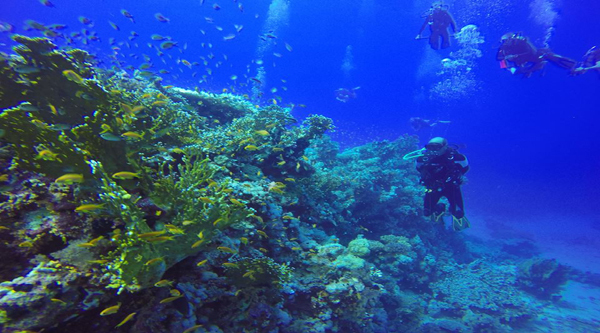 Canyon-Dahab is a fantastic dive for all levels. From a shore entry you can level off at about 30m along the gradual drop-off which continues for hundreds of metres. The canyon is a natural tunnel in the seabed which can be penetrated at several points along the rift. Once in the canyon, you can ascend up through and come out in the fish bowl, a natural cave teaming with glassfish. There is space for six divers to rest on the sandy bed, whilst the glassfish swirl around you and cleaner wrasse will inspect masks and regs. Watch out for lionfish which guard the entrance and exit from the fish bowl. Right next to the Canyon lays a beautiful coral garden. Both the Canyon and Coral Garden have the same entry and exit point. The dive starts and ends in a large blue lagoon with white sand on the bottom and cornet fish patrolling the area. Just outside of the lagoon is a spectacular pinnacle. Lots of anthias, glassfish, unicorn-fish and for the careful observer crocodile-fish are spotted on a regular basis. From here the dive continues to the deeper areas of Coral Garden. With a splendorous coral wall on your right side, the open blue to your left side and an unseen bottom below you, one feels like being in outer space. The deep part ends by ascending 'the waterfall' to the shallow coral garden. Beautifully coloured coral blocks and a variety of fish species are a real treat for enthusiastic underwater photographers.